Description: House/Villa For Sale In The Municipality of Aksakovo. We are glad to present at your attention this two storey brick house in a wonderful village. 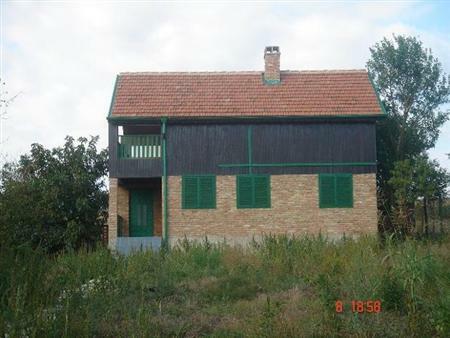 The property is located in a very well maintained village, 25km to Varna. The village is nice and peaceful and provides a shop, a pub and a regular transport to Varna Town. The region is an ecologically clean one. There are splendid views. The village is situated in countryside region extremely suitable for fishing and ecotourism. The property is surrounded by beautiful nature and has lovely view to the surroundings. This really is an ideal place and many European families have already bought land and property here. The house comprises of: on the ground floor - living room with fireplace, kitchen, store room, WC. There are internal stairs that allows you to reach second floor. On the second floor � 2 bedrooms, bathroom with WC, big terrace that catches the sun in the morning. Entering the door leading to the terrace you will breathe with pleasure the nice and pure air admiring at the fantastic landscapes. Extras: wooden window frames with dark oak pattern, wooden floorings in the bedrooms, tile flooring in the rest of the premises, fully equipped bathrooms, authentic old stone design. Connected to the property is mains water, electricity, septic tank, with telephone and ADSL Internet available. The road leading to the property is gravel-covered road but it is easy accessible even in winter. There are parking places. The plot is enclosed with a lovely brick fence. The property includes garden which is 1200 sq.meters and you can use it for many and different things like to grow vegetables and fruit trees, make swimming pool and even to make extension of the house. The property is in the outskirts of the village and this is will assure you calmness. You will be charmed of the beauty and tranquility of this place which is ideal not only for rest and relaxation but also for all year living. If you see even once that incredible panoramic area you will never want to leave it !